Will Australia’s leadership change throw a wrench into Japan’s odds of winning the Collins replacement deal? On first glance, it appears that Turnbull’s ascent to the helm of the Liberal Party and, consequently, the prime ministership, will not factor in Japan’s favor. Malcolm Cook has a helpful post over at the Lowy Institute’s blog in which he highlights the close personal rapport that Shinzo Abe, Japan’s prime minister, and Tony Abbott had established over the past two years. Abe returned to power for a second term as prime minister, leading the Liberal Democratic Party in Japan, in December 2012, and Abbott became prime minister in September 2013. Turnbull, of course, isn’t the only new figure to appear at the top of the Australian government — Abbott’s defense minister, Kevin Andrews, has been replaced as well, by Marise Payne, the first woman to hold the post. Strategic bilateral ties between Australia and Japan were better than ever during the two years of Abbott’s prime ministership: the two countries concluded a free trade agreement (JAEPA) and consulted on security issues, both independently and trilaterally with the United States. 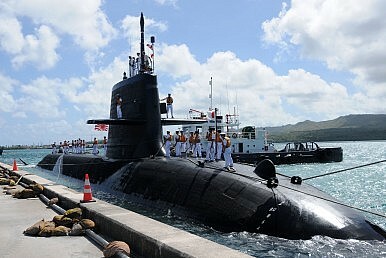 Japan even participated in this year’s Talisman Saber U.S.-Australia military exercise, held in Australia. It wouldn’t be a great surprise if Turnbull were more sensitive to domestic political factors than Abbott. Of course, this means that the Soryu could be in trouble. Recently, both members of the Liberal Party and the opposition Labor Party wrote the new prime minister to emphasize that the Collins-replacement must be built in Australia. However, in a sign that may be encouraging for the future of bilateral Japan-Australia strategic ties (if not the Soryu bid in particular), Turnbull has kicked off his term as prime minister by citing China as one of the greatest security threats to the Asia-Pacific region. Turnbull additionally said that, in the South China Sea, “China would be better advised, in its own interest frankly, not to be pushing the envelope there.” The Abbott government continued the measured approach to China that had been laid by his predecessors. Turnbull hasn’t suggested a major strategic shift, but his comments didn’t go unnoticed in China; the Chinese foreign ministry described his remarks as “counter-productive” and suggested that Australia stick to its tried-and-tested approach of not taking sides on territorial disputes. Beyond Australian politics, Japan isn’t doing itself any favors with the Soryu sale lately. As I’ve written before for The Diplomat, though the Soryu appeared to be a technical slam-dunk for Japan, outclassing its German and French competition on most counts in a spec sheet comparison, Japan still has a challenging task ahead of it. First, after emerging from decades where it did not sell offensive weapons to other states under a self-imposed weapons export ban, Tokyo’s sales savvy has been somewhat lacking. In a competitive bidding process, Tokyo’s French and German competitors, with more experience on the sales side of these sorts of deal, may be gaining an advantage. Second, the cost of the Soryus has become an issue lately. Coinciding with the leadership spill in Australia, reports emerged that several prominent former Japanese military personnel had cautioned Australia that the costs of the Soryu would balloon beyond current estimates. Many of these same officials questioned the ability of Australian shipyards to handle the construction of the Soryus. Australia is expected to award a contract for Collins-class replacement project either by the end of this year or early in 2016. For Japan and Abe, seeing the contract awarded to Mitsubishi and Kawasaki would be a major coup as Tokyo moves toward becoming a normal participant in the global defense industry. But regardless of the Australian government’s decision, there is little reason to think that under Turnbull, Tokyo and Canberra will strategically diverge.